HALIFAX, NOVA SCOTIA--(Marketwired - Oct. 18, 2016) – Erdene Resource Development Corp. (TSX:ERD) ("Erdene" or "Company") is pleased to announce the second set of results from on-going drilling at its 100%-owned, high-grade Bayan Khundii gold project ("Bayan Khundii") in southwest Mongolia. Today's results confirm a significant new discovery under shallow cover, 170 metres north of the Striker Zone. In addition, drilling continues to support continuity of the high-grade mineralization within the Striker Zone. Results are pending for 12 holes. VANCOUVER, BC--(Marketwired - October 19, 2016) - Turquoise Hill Resources today announced third quarter 2016 production for Oyu Tolgoi. Jeff Tygesen, Turquoise Hill Chief Executive Officer, said, "Oyu Tolgoi performed as expected during the third quarter as open-pit operations focused on Phases 3 and 6 after the high-gold Phase 2 was nearly complete in Q2'16. Despite the lower copper and gold production in the quarter, we are confident in our ability to achieve the higher end of our annual guidance." Oyu Tolgoi set an all-time high in Q3'16 for quarterly material mined of more than 25 million tonnes. This record includes stripping for Phase 4, which is the next area of high-grade ore. In Q3'16, concentrator throughput declined 4.0% over Q2'16 due to planned maintenance and conveyor belt repairs. Copper production in Q3'16 declined 9.9% over Q2'16, as a result of lower recovery from Phase 6 ore. As expected, gold production in Q3'16 declined 47.1% over Q2'16 due to lower grades from the completion of mining Phase 2. The Company continues to expect Oyu Tolgoi to produce 175,000 to 195,000 tonnes of copper in concentrates and 255,000 to 285,000 ounces of gold in concentrates for 2016. Good progress continues with underground development. During Q3'16, work began for Shaft 5 sinking and the convey-to-surface box cut excavation while construction of critical on-site facilities continued. Oyu Tolgoi recently signed an additional underground mining and support services contract with Dayan Contract Mining, a joint venture between Hasu Megawatt and Redpath, for the sinking of Shafts 2 and 5. At the end of Q3'16, the underground workforce was approximately 1,600 people and is expected to reach 2,400 people by the end of 2016. Recent press speculation has referenced a seven to nine year ramp up period needed for the Oyu Tolgoi underground mine to reach full production. Based on the 2014 Oyu Tolgoi Technical Report (2014 Technical Report) issued in October 2014, ramp up to full production is expected to take approximately seven years. It is expected that the underground production schedule in the Company's upcoming 2016 Oyu Tolgoi Technical Report will be consistent with the 2014 Technical Report. Additionally, the timing and amount of future dividend payments to Turquoise Hill shareholders will be based on a number of factors, including timing of underground production commencement, copper price and beginning of shareholder loan repayments, and determined at the sole discretion of the Turquoise Hill Board of Directors. The Board regularly reviews the Company's dividend policy and any payment will be based on future economic conditions. October 19, Wolf Petroleum Ltd. (ASX:WOF) -- We advise that the Resolutions contained in the Notice of General Meeting were approved at the meeting of shareholders on a show of hands. 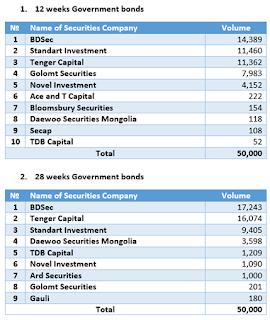 October 18 (MSE) On 18 October 2016, 12 weeks Government bonds /16.848% annual coupon rate/ worth MNT5.0 billion, 28 weeks Government bonds /16.897% annual coupon rate/ worth MNT5.0 billion traded respectively at Mongolian Stock Exchange. 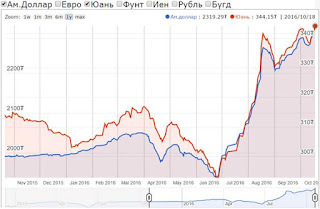 October 18 (Bank of Mongolia) Spot trade: On the Foreign Exchange Auction held on October 18th, 2016, the BOM has received bid offers of USD50.1 million in a rate between MNT2308.00-2328.10 and CNY81.8 million in a rate between MNT342.50-344.89 from local commercial banks. The BOM has received bid offers of USD12.4 million in a rate of MNT2325.91 and CNY81.8 million in a rate of MNT342.50. Swap and forward trade: The BOM has received MNT Swap agreement bid offer equivalent to USD18.0 million and BOM did not accept any bid offers. 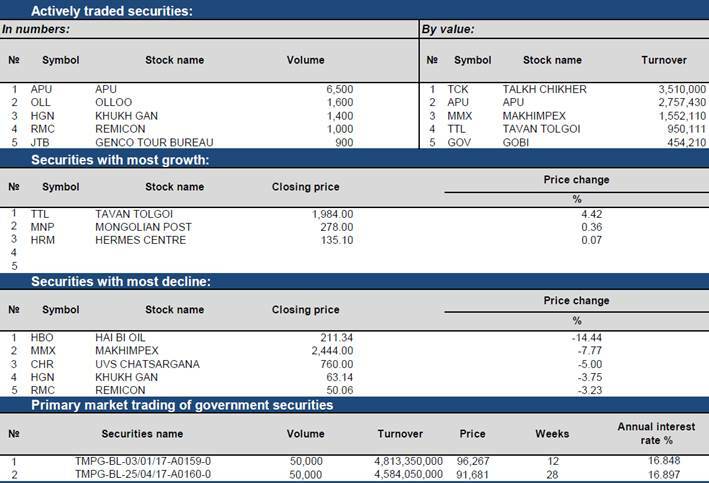 October 18 (World Economics) The Headline Mongolian Sales Managers' Index (SMI) continued to fall back on its summer gains to post a value of 39.5 in October. This represents the second monthly fall in the index value, as a run of 7 consecutive monthly gains came to an end in September. The Market and Sales Growth Indexes both experienced sharp drops during the month which has also been reflected in reduced business confidence levels. Sales managers are reporting that the weakness of the Tugrik is hurting their businesses considerably as the Tugrik is now at its lowest exchange rate against the Chinese Renminbi for well over 10 years. Ulaanbaatar, October 18 (MONTSAME) The Social Insurance Fund revenue and expenditure amounted to MNT 1303.4 billion and MNT 1276.7 billion respectively in the first 9 months of 2016. 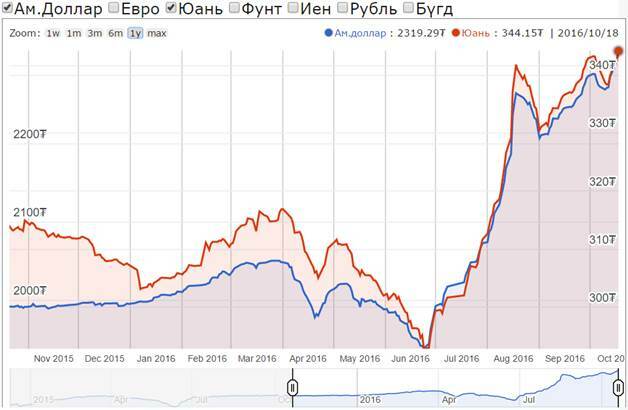 It indicates an increase of MNT 258.9 billion (24.8%) and MNT 123.2 billion (10.7%) compared to the same period of 2015. A total of MNT 112.5 billion was allocated from the Social Welfare Fund to 250.6 thousand people as pensions and welfare benefits, so far this year. The number of pensioners and welfare receivers increased by 57.9 thous (30.1), while the amount of pensions and allowances increased by MNT 3.3 billion (3.0%) compared to the same period of the previous year. In the same reporting period, MNT 159.4 billion were granted from the Human Development Fund to 1.0211 million children aged 18 and below as cash benefits. MELBOURNE, Oct 19 (Reuters) London copper was steady on Wednesday after China's economic growth met expectations in the third quarter, but an impending slowdown in real estate growth painted a mixed outlook for copper demand. China's economy grew 6.7 percent in the third quarter from a year earlier, steady from the previous quarter, as increased government spending and a property boom offset stubbornly weak exports. Industrial output and real estate investment growth, bellwethers of metals demand, beat expectations, although cities' measures to restrict home sales mean the demand growth may cool in the months ahead. China's new construction starts in September, measured by floor area, were down 19.4 percent from a year ago, Reuters calculations showed, a sharp deceleration from 3.3 percent in August. "Overall it's still consistent with our China economists' point of view that the economy is slowing but not going into a hard landing," said analyst Amy Li of National Australia Bank in Melbourne. "Base metals are used in infrastructure and real estate so we will likely see demand slow for copper and aluminium as China transitions into a more consumer focused economy." Three-month copper on the London Metal Exchange was little changed at $4,679.50 a tonne by 0250 GMT, after closing steady in the past two sessions and holding above one-month lows at $4,623.25 a tonne touched on Friday. Other LME metals showed more vigour with zinc, lead and tin all up around half a percent. Shanghai Futures Exchange copper was also flat at 37,260 yuan ($5,529) a tonne. Supporting metals, Chinese banks extended 1.22 trillion yuan ($181 billion) in new loans in September, well above expectations and capping a record nine-month lending spree. China's government also said it would strictly control the expansion of its non-ferrous metals industry, encourage consolidation and boost proven ore reserves as part of its five-year development plan for the industry. BHP Billiton on Wednesday said it was seeing signs of recovery in commodities markets but cautioned that supply was still running ahead of demand amid stronger-than-expected steel consumption in China. The total net long position of funds trading copper on the London Metal Exchange fell to 36,019 lots last Friday from a net long position of 38,602 lots the previous week, the LME's Commitments of Traders Report (COTR) showed on Tuesday. October 19 ((Reuters) BHP Billiton, the world's biggest diversified miner, said on Wednesday it was finally detecting indications of a commodity market turnaround, giving its most upbeat assessment in about five years. BHP beat analysts' estimates for iron ore and petroleum production and just missed projections for output of metallurgical coal - three commodities leading the resurgence. "This is probably the most positive assessment by BHP in five years," James Wilson, an analyst for Argonaut Securities, said. Morgan Stanley estimates that China's implied apparent steel consumption in September rose 12.5 percent from a year ago and 2.8 percent from the previous month. That is good news for mining companies looking to China to turn around otherwise sluggish demand. China's iron ore imports climbed to 93 million tonnes in September, the second highest on record. Spot iron ore last stood at $58 a ton, the highest in over a month. Metallurgical coal prices have more than doubled since January to around $230 a ton, while nickel has gained 16 percent. BHP said it was on track to meet its fiscal 2017 production guidance for iron ore of 265 million to 275 million tonnes versus 257 million last year after posting a modest 1 percent decline in output to 67 million tonnes in the September quarter. Ulaanbaatar, October 19 (MONTSAME) The polling for over 15 thousand candidates for some 7.8 thousand seats in the self-governing bodies of soums (administrative units within provinces) and city districts ended at 22.00. Chairman of the General Election Committee Ch.Sodnomtseren said the voter turnouts were insufficient at almost half of all polling stations. In Ulaanbaatar, the lowest participation was observed in Chingeltei and Songinokhairkhan districts. To be specific, only 4-5 out of Chingeltei's 19 khoroos (smallest electoral administrative unit) saw satisfactory attendance. The voter turnout data are being collected at the moment. The additional polling will be held on October 29. The General Election Committee will hold a press briefing tomorrow (October 20). ULAANBAATAR, Mongolia, October 18 (AmCham Mongolia) – In response to the recent economic instability of the country, The American Chamber of Commerce (AmCham) in Mongolia hosted the first formal engagement between the private sector and the Mongolian Government's key financial decision makers, the Vice Minister of Finance H.E. Kh. Bulgantuya and the Deputy Governor of Bank of Mongolia Mr. B. Lkhagvasuren for its October Monthly Meeting on October 18th, 2016. The meeting convened over 80 business leaders from AmCham members and other private sector representatives for a panel discussion to examine the current state of Mongolia's fiscal and monetary challenges and ways forward followed by Q&A session with the guest speakers and audience members. The panel discussion thoroughly examined crucial topics, including the Government's on-going efforts to stabilize the economy and regain investors' confidence; the development of sound fiscal and economic policies to overcome current economic challenges; the 2017 macroeconomic outlook; and efforts to promote development of the financial market in Mongolia. Her Excellency Kh. Bulgantuya, Vice Minister of Finance, commented on the Government's plan to repay foreign debt during her remarks saying, "The Government is exploring its options to repay the foreign debt. We could issue more bonds in 2017 to refinance the maturing bonds, or we could cooperate with the IMF, in which case we will have to make necessary amendments to the 2017 State Budget. The Government is also planning to meet with all of the donor organizations in early December to present the government's action plan and economic stabilization plan." During his remarks, Mr. B. Lkhavasuren, Deputy Governor of Bank of Mongolia said, "We will work toward getting Mongolia out of its economic and monetary crisis within a short period of time without making any policy missteps." "Advocating for a better business environment in Mongolia through promoting free enterprise has been one of the key focuses of AmCham since our inception and we appreciate the Government's on-going efforts to stabilize the economy, promote the private sector, and regain investors' confidence through implementation of prudent fiscal, tax and customs reforms," said Jay Liotta, Chairman of AmCham during his opening remarks. On 9 July 2015, the updated Value Added Tax Law (hereafter "VAT") was approved by Parliament, effective from 1 January 2016. A summary of the key changes is listed below. There is an element of uncertainty in the case of some provisions, and we hope that following its introduction, rulings and guidance from the MTA will help to remove this. October 19 (Lehman Law) In Mongolia company liquidation proceedings may be started by either a decision of the shareholders, or order of a court. If the company is liquidated by decision of the shareholder's, the Board of Directors (or in its absence, the executive body), will submit a draft Shareholders Resolution of Liquidation of the company. The shareholders resolution must include appointment of a liquidation commission and authorization of its commission, a liquidation timeline and if necessary, a procedure for the distribution of the company's remaining property among shareholders after creditors` claims are satisfied. The shareholder resolution must be approved by an overwhelming majority of votes of shareholders. The company/legal entity is obliged to notify the relevant state registration authority in writing within 3 working days and attach the original decision on liquidation. Upon appointment of the liquidation commission, the company's executive authority will be terminated and such authority is transferred to the liquidation commission. From then on, the liquidation commission has final authority over the company. The liquidation commission is required to publicize the pending liquidation of the company via the media. If the company has any licenses, the commission will request that they are canceled and returned to the relevant authority. The following actions must also be completed over the course of the liquidation. The State Registration Certificate of the company must be officially handed in. The company's bank accounts closed, the company's official seal must be handed over to the police. Finally a form must be obtained from the Customs Office to confirm no related taxation issues remain on behalf of the company. The Tax authority will examine and investigate the company's tax records, and an auditor will be required to handle the closing financial statements. Then an accountant will issue the closing balance of the company. Once the Liquidation commission has submitted the required documents such as the Shareholders Resolution, completion report of the liquidation, report or reference by the tax inspector and reference by court decision enforcement agency on debt obligations to the State Registration Office (SRO), the SRO will remove the legal entity from the state register. The registration body will announce publicly the deletion of the company from the State Register. It will likely take 6 months to 1 year to complete the company liquidation process. Project Description: The European Bank for Reconstruction and Development (the "EBRD" or the "Bank") and other potential lenders (collectively the Lenders) are considering financing the development, construction and operation of a 30MW solar photovoltaic (PV) power plant located 460km southeast of Ulaanbaatar (UB) near the city of Sainshand at the border of the Gobi desert (the Project). The Project site measures approximately 714,000sqm and will be connected to one of the ends of the central grid through an existing 35/110 kV substation located 3km from the project site. Assignment Description: EBRD intends to engage a consultant to advise the Lenders in relation to (i) technical and (ii) environmental, health and safety and social ("EHSS") aspects of the Project with the scope of work described below. A non-exhaustive list of the technical and EHSS aspects the Consultant is expected to address is in Annexes 2 (technical) and 3 (EHSS), as further described below. Mongolia - Consulting firm to develop feasibility study for "Shuren hydropower plant"
Selection of consulting firm to develop Feasibility Study for "Shuren hydropower plant" project. The Government of Mongolia (GoM) has received financing from the World Bank, toward the cost of Mining Infrastructure Investment Support Project (MINIS), and intends to apply part of the proceeds for consulting services. The Mining Infrastructure Investment Support Project now invites eligible consulting firms ("Consultants") to indicate their interest in providing the Services. Consulting services ("the Services") shall develop detailed set of Feasibility studies for "Shuren hydropower plant" project. It should include the detailed budget estimation, accurate phase of the project preparation plan, clarifying the timing, sequencing and coordination of studies on implementation plan. The assignment is expected to commence in February 2017. Duration of the assignment is expected for 24 months (a total of 115 Consultant staff months). This assignment requires very high qualifications, since it will be critical for determination of the overall project implementation strategy. The short listing criteria for selecting the eligible consultants are: The firm or the leading firm/main consultant in case of associations should have international experience of similar projects in similar climatic conditions in the last 5 years. Interested Consultants should provide information demonstrating that they have the required qualifications and relevant experience to perform the Services. 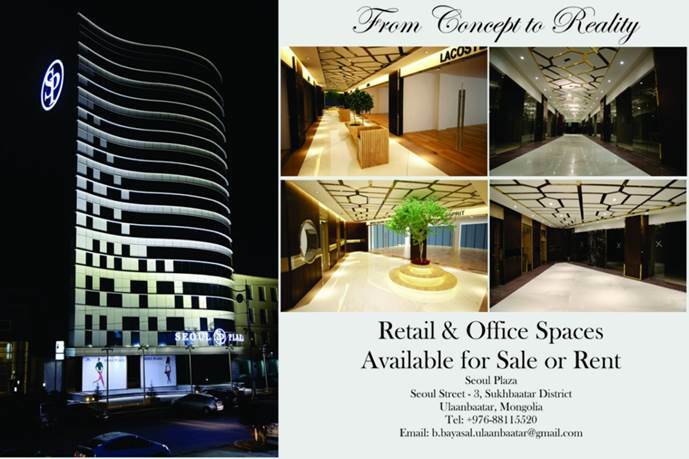 For more information please contact team in Mongolia by registering below. October 18 -- Trade and Development Bank of Mongolia (TDBM) has been recognized as the "Leading Partner Bank in Mongolia" by Trade Finance Program from The Asian Development Bank (ADB). The award was received at GTR Asia's Trade and Treasury Week 2016 in Singapore on September 7th, 2016. TDBM has been actively involved in international trade funding programs since 2005, including ADB's Trade Finance Program in March, 2010. TFP provides guarantees and loans to support trade in developing countries and has supported more than 8,200 small and medium-sized enterprises across Asia, totaling over $23.6 billion. 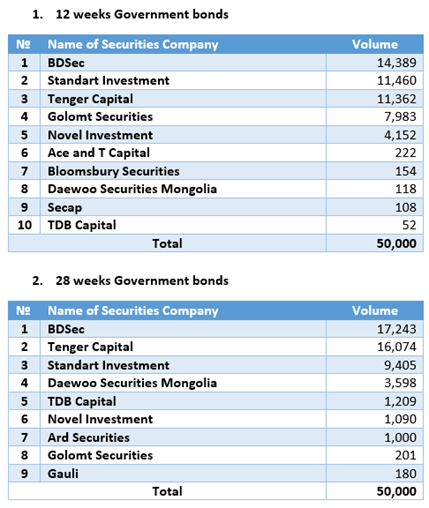 In 2015, TDBM had executed 77.9% of foreign trade related transactions and has proven its leading position in the banking sector of Mongolia through its broad network of foreign transaction settlements, highly educated banking staff and business affiliations with international banks and financial institutions. October 18 (Maptek) Maptek and IT Experts LLC have delivered an I-Site 8200 3D laser scanning system to Thiess for the Oyu Tolgoi copper and gold project in Mongolia's South Gobi Desert. The twin declines provide up to 395 metres of vertical lift with a maximum gradient of 18 per cent. The conveyor to surface declines consist of 16.6 kilometres of tunnels and 35,000 cubic metres of large excavations to house the required conveyor transfer and drive stations. 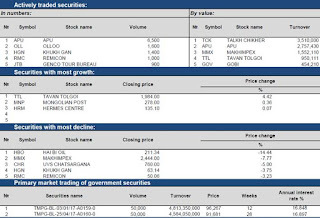 Oyu Tolgoi is jointly owned by the Government of Mongolia (34 per cent) and Turquoise Resources (66 per cent, of which Rio Tinto owns 51 per cent). Rio Tinto has managed the Oyu Tolgoi project since 2010. Maptek I-Site laser scanners are safe, portable and versatile. The I-Site 8200 system is suited to underground drive mapping and above ground survey applications. Thiess will also use I-Site Studio software with conformance reporting. October 18 (Lehman Law) The Mineral Resources Authority of Mongolia (MRAM) and Smart Oil Investment of China signed a production sharing agreement for an oil exploration site on Oct 14, 2016. Smart Oil Investment of China was selected for the tender for oil exploration at Ergel 12. The company obtained an 8 year exploration license. During that time, Smart Oil Investment plans to conduct gravity and magnetic exploration, 2D and 3D seismic surveys, and drill eight exploration and evaluation holes for the sum of 35.5 million USD. The company will spend one million USD for land reclamation. Signing an agreement with a company that has resolved investment issues and ready exploration plans in a time when the nation's foreign investment and exploration have slowed down is vital in intensifying oil exploration in Mongolia. The production sharing agreement for oil exploration is a big step towards attracting more foreign investors to the nation's oil sector. In accordance with the production sharing agreement, Smart Oil Investment will give 40 percent of oil explored to the government of Mongolia. The MRAM noted that Mongolia's stake may increase to 70 percent if the company's oil exploration is higher than 15,000 barrels per day. Ulaanbaatar, Mongolia--(WireMongolia - Sep 09, 2016) - The "Happiness Distributing" Happiness Center has been operating since 2012. This new school year, they have moved to a new location and grand opening was on September 5th, 2016 with a new and exciting image for their brand at the Tuguldur Shopping Center, owned by MGG Properties LLC. This center will be focused on expediting activities and competitions announced from MCS Coca Cola LLC for youth to take part in and spend their free time in a fun and educational environment. The center also provides the latest updates and news about the world's No.1 brand, Coca Cola. The youth center offers a free wi-fi zone with an Xbox gaming area, along with studying and reading corners for students. On the second floor, they have a space for youth to organize lectures and seminars, along with an entertainment stage that is set up for young people to practice and develop their talent. The three floor Happiness Center has the potential to organize an event for 80 people at once. MCS Coca Cola LLC invites you to spend your free time with your friends and classmates in a hip and fun environment. October 18 (UNWTO) The World Tourism Organization (UNWTO), together with the Ministry of Environment and Tourism of Mongolia and the World Cities Scientific Development Alliance (WCSDA), organized the International Silk Road Conference on Nomadic Tourism and Sustainable Cities in Ulaanbaatar, Mongolia on 13-15 October 2016. The conference gathered Ministers and high-level officials from nine UNWTO Silk Road Member States, official representatives from Silk Road regions, the United Nations Educational, Scientific and Cultural Organization (UNESCO), and UNWTO Affiliate Members to address the potential of nomadic and sustainable city tourism. The event, officially opened by the Chairman of the State Great Hural of Mongolia, Mr. Enkhbold Miyegombo, attracted over 350 delegates from 21 countries. The Silk Road has become one of the most visited international travel routes. Despite such growth, an increase in visitation also brings challenges, such as the protection of the environment and the maintenance of necessary heritage standards. Bearing in mind the Sustainable Development Goals (SDG's) and the upcoming International Year for Sustainable Development for Tourism 2017, participants discussed these challenges and the large potential of developing nomadic tourism trails and products. "The sustainable growth of nomadic tourism requires a balance between tourism promotion, heritage management and respect for local communities. It requires the collective engagement and cooperation of Silk Road destinations, the private sector and the civil society. With these ingredients in place, we can produce responsible nomadic tourism products to diversify Silk Road tourism and achieve the adequate tourism development for the countries involved." said UNWTO Secretary-General, Taleb Rifai in opening the conference. "Today we welcome, with our uttermost respect and pride, all delegates to the International Silk Road Conference on Nomadic Tourism and Sustainable Cities. We believe that the great and historic Silk Road will be revived as an exciting route full of travelers and adventurers, hereby becoming a symbol for mutual understanding and peace among nations in the new millennium." said the Minister of Environment and Tourism of Mongolia, Ms. Oyunkhorol Dulamsuren during the opening ceremony. The Silk Road countries agreed that, while the Silk Road presents extensive opportunities, long-term success will depend upon increased collaboration in the three key areas identified in the Silk Road Action Plan: marketing and promotion, capacity building and destination management, and travel facilitation. UNWTO would like to thank Turkish Airlines for supporting this event. Local Procurement in Mongolia: "All the Pieces Are in Place"
August 2016 (Mongolian Mining Journal) The concept of local procurement reporting is quite new in Mongolia and a Canada-based organization, the Mining Shared Value initiative of Engineers Without Borders, has taken up a project to develop the practice on the ground. Taking turns to answer questions, Jeff Geipel, Venture Leader, and John Kielty, Project Consultant, explain to MMJ what they plan to do and how that would benefit Mongolia's mining sector. What is Mining Shared Value? And what is the local procurement reporting standard you are working on in Mongolia? John: Mining Shared Value (MSV), a venture of Engineers Without Borders Canada (EWB),works to increase local procurement by the global mining industry so that host countries gain more economic and social benefits from mineral extraction. Since 2012,MSV has promoted the positive benefits of local procurement through projects such as researching procurement from Aboriginal businesses in Canada, examining how local content regulations in Sub-Saharan Africa affect company behaviour, as well as acting as a founding member of the World Bank's Extractives for Local Content Development Community of Practice (CoP). It was our annual report to measure how Canada and the world's largest mining companies publicly report on local procurement that led to our current project with Deutsche Gesellschaft für Internationale Zusammenarbeit (GIZ) GmbH to support the creation of a measurement and reporting initiative for local procurement in the mining industry. The need for a reporting system for local procurement in mining stems from the current lack of depth in commonly used reporting frameworks. Existing reporting systems like the Global Reporting Initiative (GRI) exist and do encourage reporting on local procurement, yet the details required are not extensive, and the information created does not fully empower mining companies and host countries to better manage the procurement process. Importantly, this new reporting system we are creating will be designed to work with existing standards like the GRI so as to not create a reporting burden for companies. You've recently been in Mongolia. How is the project progressing and how is the reporting standard being developed? Jeff: The project is progressing well and through extensive consultation we have developed a draft standard which we are testing in several very different environments where mining takes place including Mongolia, Albania and Mali. In each of these pilot countries we are meeting with a wide range of stakeholders including mining companies, local and national governments, civil society organizations, chambers of commerce, mining associations and others. The feedback collected from these one-on-one and group interviews will assist in creating a reporting standard that is useful for companies to include in their existing reporting practices and for external stakeholders to understand the local procurement practices at a particular mine site. Ultimately, the end result will allow for a well-informed dialogue between stakeholders and will help set reasonable expectations on all sides. Similar to the intention of the Extractive Industries Transparency Initiative (EITI), a standardized reporting framework will allow for increased transparency and cross-comparisons between mining operations and host countries. What result do you expect from the implementation of the standard? John: When the reporting standard for local procurement is completed later this year, it will be available for use by any mining company around the world to report on their local procurement activities. For mining companies, having more information about their procurement activities can provide opportunities to identify cost savings through increased purchase of goods and services from local, regional or national businesses. It will also help them increase local economic benefits, and this will help companies develop and maintain their social licence to operate. While the standard can be used voluntarily by mining companies anywhere in the world, the standard can also be adopted as a requirement for reporting that companies provide to governments, or as a condition of membership in mining industry associations. For external stakeholders, such as government, chambers of commerce, existing and potential suppliers, and communities, more information about what mining companies are buying can provide the basis for informed discussions to increase and monitor economic benefit sharing, identify strategic areas for supplier investment, and facilitate increased coordination among stakeholders to engage mining companies. When do you expect the standard to be implemented in Mongolia? How can Mongolia use this standard for its benefit? Jeff: The reporting standard can be taken up by mining companies as soon as it becomes available at the end of 2016. Any mining company in Mongolia can use the standard and would be able to include local procurement reporting as part of its regular reporting activities, such as in its annual mine and environmental plans as well for following up on their obligations incommunity development agreements. These existing reporting mechanisms provide an opportunity for local and national governments to collect information that can support policies and planning for local and national economic development. What are the challenges and opportunities of local procurement in Mongolia? John: Mongolia is a big country with a small population. Therefore, maximizing the economic benefits of mining requires extensive communication and coordination. With a relatively small market size and competition from Chinese and other suppliers, it is vital the country effectively targets goods and services they realistically can supply competitively. Many goods and services are already available in aimag and soumcentres, but the information about what mining companies need isn't readily available. Mining companies tend to have offices in UB and operations in the field, so the regular access for aimag and soum governments to mining companies isn't there. When particular goods and services are not available locally or even in Mongolia, mining companies may not see the potential to reduce long term costs and build positive ties with the communities through investing in new and growing local businesses. Greater communication on mine site needs and what enabling factors are helpful for local businesses can lead to increased cooperation to identify opportunities to shift supply chains closer to where mining takes place. Comparatively speaking, with your experience of other countries, how do you rate the local procurement situation in Mongolia? How can we improve this? Jeff: While the economic benefits from mining may be not be currently maximized, Mongolia is in a very good position to increase the amount of what companies buy in the regions where they operate and across the country. All the pieces are in place for stakeholders to work with mining companies to increase their local and national spending. Aimag and soum governments are keen to engage mining companies and make use of the community development agreements as a vehicle to promote local business. Where business councils and chambers of commerce are in place, they want to promote their members' business to the mining industry. With increased information, all stakeholders can speak the same language around what mines need,which can facilitate conversations about how the government and the business community in Mongolia can target those needs. October 18 (Mongolian Economy) The government has expressed support for an initiative by the Ministry of Energy to reduce energy shortages in the central and eastern regions of Mongolia. Accordingly, the capacity of Thermal Power Plant III in Ulaanbaatar will increase by 250 MW, improving heating for various areas of the city. The upgrades will also allow for 25-30,000 additional apartments to be heated, and furthermore, the move will save MNT 10-15 billion in domestic energy costs by reducing energy imports from Russia. From recent experience, Mongolia was able to save MNT12 billion by reducing energy imports from Russia by 44 million kilowatts. Furthermore, a power plant with a capacity of 10 MW to be commissioned near the end of this year is currently under construction in Khongor soum, Darkhan Province. BEIJING, Oct. 18 (Xinhua) -- Chinese President Xi Jinping on Tuesday called for more concrete exchanges with Mongolia in terms of governance and interaction between the two ruling parties. Xi made the remarks while meeting with Miyegombo Enkhbold, chairman of the Mongolian People's Party (MPP) and chairman of the State Great Hural, Mongolia's parliament. Hailing the sound momentum of China-Mongolia ties, Xi said both countries have placed great focus on each other when developing their respective foreign policies. The Communist Party of China (CPC) and the Chinese government have pursued relations with Mongolia from a strategic standpoint and with a long-term perspective, he said, vowing to enhance coordination and cooperation with the country to boost bilateral all-round strategic partnership. Xi urged the two sides to maintain high-level exchanges, deepen political party exchanges, properly handle sensitive issues and support each other on issues regarding respective core interests and major concerns. Enkhbold, who is on his first China trip since taking office in July, spoke highly of the Belt and Road Initiative and China's friendly diplomacy toward its neighbors. "[China has] provided guidance for deepening bilateral ties, maintaining regional peace and stability and boosting cooperation with countries along the Belt and Road," he said. The Belt and Road Initiative, proposed by Xi in 2013, refers to the Silk Road Economic Belt and the 21st Century Maritime Silk Road. It will be a trade and infrastructure network connecting Asia with Europe and Africa along the ancient trade routes. Enkhbold said that the parties of Mongolia, though they may hold ideological differences, all agree to enhancing ties with China. The MPP values its friendly ties with the CPC and expects closer exchanges, he added. Enkhbold attended an annual dialogue between the CPC and various parties of the world, held in Chongqing Municipality in southwest China last week. He said the dialogue was an important sharing platform for parties to discuss how to innovate global economic governance. Later on Tuesday, top legislator Zhang Dejiang met with Enkhbold. Zhang pledged to further strengthen cooperation between China's National People's Congress and State Great Hural. Enkhbold said Mongolia is ready to enhance parliamentary links with China. Ulaanbaatar, October 18 (MONTSAME) The sides have been negotiating to establish an intergovernmental agreement on export loan of EUR 50 million in the near future, said the State Secretary of the Ministry of Foreign Affairs, D.Davaasuren on Tuesday. He added the Mongolian foreign policy prioritizes bilateral relations with the two neighbors -Russia and China, and then accents the ties with highly-developed countries of the West and East and our "third neighbors". Ulaanbaatar, October 18 (MONTSAME) Mr A.Baatarkhuyag, the Director of MONTSAME agency welcomed at his office on Monday Mr Murat Karagoz, the Turkish Ambassador, being recalled after successful completion of diplomatic mission. The Ambassador played an important role in formalizing the cooperation between MONTSAME and Anadolu, the largest official news agencies of the two countries. A.Baatarkhuyag expressed gratitude for introducing the Turkish media delegates to the agency and making the first move for today's successful cooperation, and wished success in Ambassador's further career. Ambassador Karagoz thanked MONTSAME's reporters, who delivered truthful and prompt news to Mongolia's public about the attempt to coup d'etat, happened last summer in Turkey. The Ambassador pledged his assistance in promoting communication between the media and press organizations of Mongolia and Turkey. October 19 (Global Times) The Dutch ambassador to China involved in a "love affair" with a Chinese embassy employee has been suspended as an investigation gets underway. "An inquiry into this case has been opened," Mariska Driessen, policy officer of the Embassy of the Kingdom of the Netherlands in China, told the Global Times in an email, noting that Ambassador Ron Keller, 58, would not perform any functions for the embassy while the probe is being conducted. Keller had a secret affair with a Chinese national who worked at the embassy, and the relationship between the ambassador and the Chinese woman had only recently come to light, Dutch newspaper De Telegraaf reported on Monday. "A complaint against The Netherlands' ambassador to China is being investigated ... The integrity of the complaint procedure requires that, at this stage, the ministry cannot share further details regarding the inquiry," said the email. Keller is currently in his country and not likely to return to Beijing, the newspaper said. He was appointed ambassador to China and Mongolia in December 2015. He had represented his government in Turkey, the Russian Federation and Ukraine before assuming his post in Beijing, said the official website of The Netherlands Embassy and Consulates in China. According to the Daily Mail, a statement, released upon Keller's appointment, said that "Keller hopes to contribute to a further strengthening of the cooperation and friendship between The Netherlands and the People's Republic of China and Mongolia." Hanoi, October 18 (VNA) – Prime Minister Nguyen Xuan Phuc hailed Mongolian Ambassador Dorj Enkhbat for working to promote the traditional friendship and cooperation between Vietnam and Mongolia during his working term here. The PM said goodbye to the ambassador at a reception in Hanoi on October 18 and noted that the diplomat contributed to bringing the two countries' ties in politics, economics, culture, and people-to-people exchange to new heights. He said the countries have coordinated soundly at international forums, like the UN, NAM and ARF, and achieved encouraging outcomes in trade with value reaching over 30 million USD. He proposed Mongolia exporting cattle meat to Vietnam and Vietnam selling coffee, rice and other farm products to Mongolia to increase the trade value. The PM asked the diplomat to convey his invitation to visit Vietnam to Prime Minister J. Erdenebat. Ambassador Dorj Enkhbat said he felt honoured to work in Vietnam and was impressed with the host country's nation-building achievements. He pledged to continue doing more for the growing relations between the two countries. October 18 (news.mn) A one-week intensive training course for Mongolian law enforcement personnel aimed at increasing their operational awareness to detect forged travel documents started today in Ulaanbaatar. This is the first of a series of trainings courses organized by the OSCE on detecting forged documents that will take place every autumn in Mongolia over the next five years to 2020. The training course, organized by the OSCE Transnational Threats Department (TNTD), will have a strong interactive component, as it will include practical work on original, forged and false documents, as well as the use of forensic equipment to identify document forgery. The growing volume of new passports and other identity documents in circulation has resulted in a diversification of forgery trends and more complex forgery methods, which requires that border control officers are up to date on the latest trends in document fraud. In this context, border control capacities for the efficient detection of forged documents are one of the most significant tools to counter concerns of terrorism, trafficking, organized crime, and illegal migration. The advance training course represents an effort to 'institutionalize' the previous work of the OSCE in Mongolia. From 7 to 11 March 2016, the TNTD trained 35 Mongolian officers on the passport manufacturing process, identity document security features, as well as the latest trends in counterfeiting methods and the means of identifying them. The follow-up training courses will allow for a sustainable and viable national training programme in Mongolia. The OSCE has organized similar courses on multiple occasions in more than 25 countries throughout the OSCE region, in co-operation with document experts from the Austrian Ministry of Interior. The Austrian training material is accepted by the European Agency for the Management of Operational Co-operation at the External Borders (FRONTEX) as a best practice. The training is being organized with donor support from Germany's 2016 OSCE Chairmanship. October 18 (Malaysiakini) Dr Shaariibuu Setev suspects Mongolia, Malaysia and Australia have colluded to mute the politically sensitive case of an ex-Malaysian policeman who murdered his daughter a decade ago and has lately been held in immigration detention in Sydney. Setev is a university professor of film study in Ulaanbaatar, the capital of Mongolia. His eldest daughter, Altantuya Shaariibuu, 28, a globetrotting translator and mother of two sons, was killed overnight on Oct 19-20, 2006, by two Malaysian police officers. She was shot twice in the head before being wrapped in military grade explosives and blown to pieces in a forest on the outskirts of Kuala Lumpur. The motive for the crime and the source of the policemen's orders remain unknown. The killers, Chief Inspector Azilah Hadri (photo, far right) and Corporal Sirul Azhar Umar (photo, middle), were members of an elite police commando unit that provided bodyguards for Malaysia's top leaders, including then Defence Minister Najib Razak, now prime minister. Sirul has been in Villawood Immigration Detention Centre in Sydney for the past 21 months, after he was picked up for an expired tourist visa. Government officials have made no comment when asked if it was unusual for a person to be held for so long over an expired visa. Nor have Australian officials linked - at least not publicly - Sirul's detention to a murder conviction and death sentence that was unusually passed on him in absentia in Malaysia last year. Australia has a policy embedded in its Migration Act that prevents people being extradited to any country where they would face the death penalty. When asked if the policy is relevant to the case, there has been no official comment. "It looks like Mongolia, Malaysia and Australia have made a deal to be silent about this case. No one is making a noise. Isn't it obvious?" an emotional Setev said in his university office. "The Mongolian government is doing nothing. The Mongolian minister of justice now runs away from me. If he sees me walking through this door, he goes out the other door." In a message sent on Monday, Setev added that he thought that the three governments were waiting for time to pass so that the case against Sirul could somehow be dropped in the future. When approached earlier, a spokesperson for Australia's Minister for Immigration and Border Protection, Peter Dutton, offered no comment on Setev's tri-nation "deal" suspicion. The federal attorney-general, George Brandis, whose office handles extradition matters, did not respond when the same question was sent to him via his staff. Altantuya was murdered shortly after flying to Kuala Lumpur to face a married political analyst who reportedly had abruptly ended a romance they started in 2004. The analyst, Abdul Razak Baginda, was a friend and confidante of Najib, who has strongly denied ever meeting Altantuya or having any part in her murder. The trial heard she made numerous failed attempts to see Abdul Razak (photo) at his home and office. Two days before her murder she angrily called from the street for him to come out of his house. On the evening she died, she returned alone in the belief he would talk to her. Instead, police arrived and took her away - ultimately to her death. Later, in the forest, with Sirul and Azilah, she reportedly pleaded she was pregnant. Setev doubts that, saying "a person can come up with anything to save their life. I see it as her last chance." Abdul Razak was later charged with having abetted her murder, but was acquitted at a trial in 2008 because the prosecution did not have a prima facie case. No evidence was given. Sirul and Azilah both pleaded not guilty but were convicted after a 159-day trial, including long adjournments. Sirul only read out a prepared statement, in which he was reported to have tearfully claimed to be "a black sheep who has to be sacrificed" to protect unnamed people. Both men were acquitted by the Court of Appeal in 2013. Sirul became Australia's problem after he managed to leave Malaysia - his passport had not been confiscated - and enter Australia on a tourist visa in October 2014, just when Malaysia's highest court, the Federal Court, was hearing an appeal against the men's acquittal. Three months later, in January 2015, the Federal Court reinstated their convictions and death sentences and Azilah went onto death row. About that time, Sirul was picked up in Queensland, Australia, where he was staying with relatives on his tourist visa. Sirul last year applied for a protection visa to allow him to stay in Australia but officials say privacy issues prevent comment on any such matters. Rumour has circulated for years that Altantuya died because she tried to capitalise on inside knowledge - gained as a translator - of allegedly corrupt negotiations for Malaysia to buy two French-built submarines, by blackmailing Abdul Razak for US$500,000. Her family's Malaysian lawyer, Ramkarpal Singh, rejects the gossip, saying she met Abdul Razak two years after the negotiations, which did not arise during the long murder trial. The story was "full of holes" and could not be connected to the case, Ramkarpal said. According to a report of police testimony by Malaysiakini in 2007, a "disturbed" and "pressured" looking Altantuya went to a police station earlier on the day of her murder to file a self-typed report in which, in broken English, she repeatedly expressed fears for her life. She wrote, "I'm just a normal girl trying to meet my lover who lied to me and promised many things but now (he) want(s) to put me in jail or kill (me). Only reason I'm here (is) because he ruined my life with lies… but now (he is) trying to scare me and kill me… I really understand he doesn't love me any more… I want to go back safely." She was dead that night. Malaysiakini also told in 2007 how the trial heard a letter in her handwriting was found in her hotel room after her death. In it, she admitted having threatened to harm Abdul Razak's daughter, and regretted having "bothered" and "blackmailed" him, without specifying how. But she also wrote, "I'm (a) nice person. I can't hurt someone but (Abdul Razak) is a powerful person, he (has) money (and) he (has) connection (to the) police (and the) government… If he didn't promise me, I would (have) never come from far away to Malaysia." Meanwhile, her father, Setev, is further angered by Sirul being held in the relative comfort of immigration detention, instead of in a prison. "Why would they happily keep this murderer there?" he asked. "He has everything he needs… the Internet, phone, (relative) freedom, a kitchen… Imagine a person who is asking to live in your country is sitting next to a murderer. Is it right? Detention centre is not jail." In January, Setev asked the National Human Rights Commission of Mongolia to help him have Sirul extradited to Mongolia - where the death penalty was abolished last year - to serve a prison term. The Mongolian body's letter to Australian Human Rights Commission president, Professor Gillian Triggs, brought a reply that she could do nothing. Around that time, Mongolia's state prosecutor told Setev there was no legal possibility for his plan so he abandoned it, but he pressed on "for justice". On June 15, he hand-delivered to Australian embassy officers in Ulaanbaatar a letter that supported Australia's stance against the death penalty, but argued that Sirul should be in a prison. At last report, Canberra had not replied to him. Meanwhile, Ramkarpal, the family's lawyer, and also a member of the Malaysia's opposition Democratic Action Party, says he has raised the question of Sirul's extradition "many times', in Parliament and with the attorney-general. Despite the government's repeated assurances that it would move to extradite Sirul, it has not yet done so and "there has been no satisfactory explanation for a year now", Ramkarpal said. He acknowledged that Australia, due to its death penalty policy, was "extremely unlikely" to extradite Sirul but he believed the Malaysian government was bound by its repeated assurances to try. Ramkarpal (left in photo) said Sirul's extradition would require court proceedings in Australia, even if his death sentence had been commuted, and that could be concerning for some parties in Malaysia. "A lot of things would have to be revealed in extradition proceedings (and) Sirul might disclose matters which have not been disclosed in the past in order to absolve him of the predicament that he faces. "And perhaps they don't want him back in Malaysia because he might raise all sorts of allegations in his clemency petition. It's all speculation. "Sirul is hopeless. I think he's lost all credibility. He's said things which are bizarre, to say the least, and if it comes down to a question of believing his credibility, I don't think he's going to go very far. (But) anything he said (during extradition proceedings) would make headlines all around the world." Ramkarpal said the situation could have been avoided had the Malaysian Federal Court postponed the proceedings that led to Sirul's re-conviction in January last year. Sirul was an acquitted man up to that point and the court had the power to delay until he returned to Malaysia. And if satisfied he was evading return, it could have issued a warrant for his arrest. "Now, if that had been the case, there would not have been a conviction or a death sentence against him at that point in time, and the Australians would very likely have sent him back," Ramkarpal added. Meanwhile, despite wanting Sirul and Azilah to be punished, Setev does not want them executed. "The death penalty is an irresponsible act," he said. "One should feel sorrow for what one does throughout his lifetime. Thus, killing is an act of resting that animal. Killing those two murderers is also the act of getting rid of the witnesses." Ulaanbaatar, October 18 (MONTSAME) Minister of Health A.Tsogtsetseg received Tuesday the World Bank Country Manager for Mongolia James Anderson and senior economist Aparnaa Somanathan along with other officials. Mr Anderson briefed about the World Bank's ongoing mission for assessing implementation of the E-Health Project. The Minister underlined the ministry highly recognizes an importance of the project and advised to attach more focus on the project's coherence with other similar projects. Ms Somanathan said the site visit to the local health centers and family hospitals has helped obtain realistic information and detect main problems regarding the operations of medical equipment, IT system and current state of information sharing between and within the health organizations. Minister A.Tsogtsetseg promised to support the project implementation through all possible means. Ulaanbaatar, October 18 (MONTSAME) LEAD Mongolia finished receiving the first-round applications for 30 trainee positions on Friday, October 14. The LEAD Mongolia Program was launched on September 21 by the US Embassy, US-AID and the Mongolian Government. In the margin of its USD 2.5 million cost, the program will recruit 90 young leaders from Mongolia aged between 25 and 40. The first 30 will be selected and will receive a 3-week training, focusing on environment and urbanization, poverty alleviation and unemployment, and transparency and anti-corruption. The UNFPA Internship Programme offers a small group of outstanding students the opportunity to acquire direct exposure to UNFPA operations. It is designed to complement development-oriented studies with practical experience in various aspects of UNFPA work. Applicants should have expressed interest in the field of development; ability to adapt to new environments and work with individuals from different cultural backgrounds. Interns work under the supervision of a staff member at UNFPA. The background of the interns is matched with the needs of the organization. - Students must have written and spoken proficiency in English; fluency in Russian or other UN languages is an asset. October 18 (gogo.mn) The Public Health Institute introduced the customized the fifth breakfast menu, suited for Mongolians. It includes a glass of blueberry juice, a boiled egg, two slices of watermelon, and two oat cookies which has total of 349.4 kcal. Routinely eating breakfast helps prevent weight gain. The institute designates that average adult's energy intake should be around 2,100-2,500 kcal a day, of which 20-25% must be taken from breakfast, 10-15% from brunch, 35-40% at lunch and 15-20% must be at dinner. Duke University's Division of Infectious Diseases invites applications from US citizens for a very unique two-year postdoctoral associate position, who will, with a team of two other postdoctoral associates from Mongolia, design and apply innovative solutions to Mongolia's zoonotic disease problems. The trainee will receive comprehensive instruction in the concept of One Health, which seeks to utilize cross-cutting interdisciplinary strategies to solve complex public health problems. This postdoctoral training program will occur in two phases. Phase I will involve 2 months of initial training at Duke University (May 18, 2017 – July 17, 2017), where the team will receive structured One Health didactic training (One Health Training Program), as well as training in ethical conduct of human and animal research. Then, the team will work closely with an advisory committee to develop a pilot study of an innovative solution for one complex zoonotic disease problem in Mongolia. Once a research plan is approved by the advisory committee, the team will begin Phase II, where they will work in Mongolia on the zoonotic disease problem (July 2017 – April 30th, 2019). While in Mongolia, the team will work with Mongolian government officials to conduct the study, which will likely consist of considerable travel to rural parts of Mongolia for field collections. While the postdoctoral team will be closely monitored, the team will be strongly encouraged to conduct independent team problem solving. After the team completes their study, they will be asked to transfer their knowledge to regional public health, veterinary and environmental health professionals throughout Mongolia, as well as translate scientific findings into prevention practices or products that will help to reduce the burden of zoonotic diseases among pastoral people worldwide. Applicants should be US citizens and have doctoral degrees in public health, veterinary medicine, environmental health, medicine, epidemiology, microbiology, entomology, or a related field. This two-year fellowship includes annual support with a Kirschtein-NRSA award-level salary ($47,476), round-trip airfare to Mongolia, research office support, Duke University employee benefits https://www.hr.duke.edu/benefits/), plus cost-reimbursable housing expenses (up to $10,000/yr). Duke University is a comprehensive research institution that includes a remarkably wide range of academic departments and programs (www.duke.edu) and is recognized as one of the premier research institutions in the U.S. Duke is uniquely positioned to provide excellent opportunities for collaboration with colleagues across a variety of disciplines. Applicants should send their CV with a cover letter explaining how they fit this program, as well as references (names and contact) to Professor Gregory C. Gray at gregory.gray@duke.edu by November 15th, 2016. October 17 (RMIT University is inviting applications for international excellence scholarship for Mongolia. These scholarships are available for associate degree, bachelor's degree and masters by coursework. The aim of the scholarship is to enable and encourage academically able students from Mongolia. RMIT University (officially Royal Melbourne Institute of Technology) is an Australian public university of technology and design based in Melbourne, Victoria. A valid English proficiency test must be submitted for programs with an IELTS entry requirement of 7.0 and above. Course Level: Scholarship is available for associate degree, bachelor's degree and masters by Coursework. Study Subject: Scholarship is offered in diverse fields to help students in upgrading their education. Scholarship Award: The total value of the scholarship is AU$5,000, paid in the first semester of the first year. Funding under the New Colombo Plan has been granted for a Community and Cultural Development Tour to Mongolia scheduled for June/July 2017. The focus of the program is to experience Mongolian culture and to undertake community service while gaining international experience relevant to your undergraduate degree. The experience has been designed to be relevant to students from 'welfare disciplines', but may also be of interest to students from a broad range of disciplines within the school, including Arts, Media, Communications and Design. Students from other disciplines are encouraged to apply as the opportunity to work in multi-disciplinary teams will be an outcome of this experience. The funding will subsidise the costs for ten students, all of whom must be Australian citizens and will be Ambassadors for Australia. Under the funding, the program is open to students over the age of 18 years, however, 70% of students must be under 28 years old. This Study Tour unit has the potential to be counted as an elective which will be individually negotiated. The students will be supported 'in country' by ECU academics and an interpreter. ACMS Speaker Series – Dr. Jeffrey L. Falt & Oyungerel Tsedevdamba: "The Green Eyed Lama"
"The year is 1938. The newly-installed Communist Government of Mongolia, under orders from Moscow, launches a nation-wide purge. Before it's over, nearly tenth of the country's population is murdered. Sendmaa, a young herdswoman, falls in love with Baasan, a talented and handsome lama. Baasan resolves to leave the priesthood and marry Sendmaa, but her scheming neighbor, persuades Baasan's brother, Bold, to "ask a bride" first. Their love triangle is engulfed by tragedy when Choibalsan, Mongolia's Stalin, moves to crush the Buddhist faith. As the country teeters toward war, Baasan is sentenced to death as a class enemy. But an improbable ally, a lama turned "KGB" agent, intervenes in a way that reaches all the way to Franklin Roosevelt. Still, Baasan must summon every bit of his talent and ingenuity if he's to survive the gulag, reunite with Sendmaa, and help save the Buddhist faith." For nearly 10 years the Mongolian version of The Green Eyed Lama" has been on the Mongolian best sellers list, and has won numerous awards. The book has been recently released in French and the English version is in the final stages of editing. This presentation by the author Oyungerel Tsedevdamba, former Minister and human rights activist, will discuss the history, issues and lessons to be learned from this dark period of Mongolia's past. October 18 (ANS – Ulaanbaatar) – In June 2016 the Rector Major Fr Ángel Fernández Artime gave approval for a new Salesian work in Mongolia and the Salesians are now happy to open a new m­­­­ission. On 15 October 2016, on the feast of St Teresa of Avila, Bishop Wenceslao Padilla of Mongolia, introduced the Salesians and the FMA sisters to the local faithful during Mass. More than 40 people attended this ceremony. After Mass the faithful organized a concert and reception in Mongolian "Ger" (house). Fr Paul Leung, newly appointed Delegate of Mongolia, addressed the people saying that he would give full support to the mission in Shovoo. This new foundation of the Salesians is a mission centre which was run by the bishop himself for the past 15 years. The bishop wanted to entrust this mission to a religious congregation but due to lack of personnel and resources no one was able to take it up. This year the Mongolian mission has been blessed with three missionaries who finished their studies and other tasks and are back to Mongolia. With the arrival of these missionaries the process of expansion and development continues in Mongolia. Shovoo, which means "bird", is a village 40 kilometers away from Ulaanbaatar. It has around 60 Catholics and there are many children and youth. It is surrounded by hills and rivers and rich pasture land. Agriculture is the main occupation of the people. To pioneer the mission of Shovoo, Fr Andrew Nguyen Tin, the former Delegate, and Fr Mario Gasper, have been assigned by the province of Vietnam-Mongolia. The Delegate of Mongolia wishes them success and perseverance and assures them of prayers and support. Producer Stacey Reiss talks to 13-year-old Aisholpan Nurgaiv about how she overturned 2,000 years of male tradition. October 18 (Harper's Bazaar) As the producer of The Eagle Huntress, I spent many months getting to know Aisholpan in the edit room before I met her in person in Mongolia. I began working on the film after director Otto Bell had already started filming, so I watched hours and hours of footage of her performing innumerable daring acts—climbing big mountains, catching an eagle, and competing against men twice her size in the annual Golden Eagle Festival. She came from a long line of eagle hunters; her father and grandfather both practiced this ancient ritual of using golden eagles to hunt for food, but in 12 generations there had never been a young woman to carry on this tradition. When I finally traveled to Aisholpan's remote home to meet her, what struck me most was how closely we had captured Aisholpan's authentic self in the film. She wasn't trying to be brave or courageous, or even smash the glass ceiling of male-dominated eagle hunting. She was simply a 13-year old girl who liked to spend time outdoors with her father, who felt this was in her blood and wanted to try it out. Once Aisholpan's father saw the natural bond his daughter had with his eagle, he knew he wanted to train her. Aisholpan didn't hear the words "no" or "you can't do it." Her inner strength came from following her convictions, listening to her heart and knowing her family was there to support her. They provided the foundation she needed to take an enormous leap. Aisholpan is daring because she was never taught anything different. Stacey Reiss: What do you think that word daring means? Aisholpan Nurgaiv: I try to take risks. There is a Kazak saying that if you keep trying, then finally you will get there. My parents have been saying that to me from when I was a child. SR: When was the first time you wanted to learn how to become an eagle hunter? AN: When I was 10 years old. I knew I wanted to become an eagle hunter after seeing my father hunting and looking after his eagle. SR: Were you scared at all? AN: No, I wasn't afraid. SR: There's a scene in the film where your friends are nervous about what it would be like to train an eagle. Where did you get your strength from? AN: For me, the eagle is like a member of my family. I have never been scared of the eagle because I grew up with them. Many of my family are eagle hunters. My father and all of his brothers and their sons are all eagle hunters. SR: When you first said you wanted to be an eagle huntress what did you parents say? AN: They said I could do it, from the very beginning. SR: Why do you think they were so supportive, when other men in the community were against you training your own eagle? A: Maybe because I love the eagle. SR: When you arrived at the festival with your father as the first-ever female eagle hunter, there were hundreds of men staring at you. How did that make you feel? AN: I was nervous, but I felt beautiful. It's difficult for me to describe my feelings. "Now everyone knows I am a full-grown eagle hunter and they are afraid of me." SR: Did you think about that you were the first woman to do this at that festival? Where did you get that courage? AN: I knew that I was the only girl and the youngest. But I just wanted to try it. I just wanted to do what my father was doing. SR: There is a scene where some of the other eagle hunters are not so happy that you were there. Did you realize that? Did it make you want to win more? SR: You make it look easy. Like when you scale a mountain to the baby eagle. And I know from when I went to Mongolia and held an eagle, they are so heavy. I can't imagine having to ride at the same time. AN: It was easy for me because I would walk on the mountains for fun, so there was nothing to worry about. The eagle was a little bit heavy but it's not that hard for me. SR: You climb mountains literally and figuratively, and when I look at you there isn't a mountain you don't want to climb. Is anything hard for you? SR: What are your plans for the future? AN: I want to graduate high school and go to university and become a doctor. In the future I want to study in the United States. I want to be a surgeon and a doctor because my mother often got sick and I knew I could help her if I was a doctor. SR: Who has inspired you to achieve what you have? AN: My father first, and then my mother. SR: We talked about some of the people at the first eagle festival who weren't supportive, but now you are competing in the festival for the third time, are they more supportive? Have things changed since you started? AN: Now everyone knows I am a full-grown eagle hunter and they are afraid of me. SR: Do you think you have proven yourself? The Eagle Huntress opens in theaters in New York and Los Angeles on November 2. October 10 (History News Network) The Mongols fought and won in Syria, Afghanistan and Iraq – our three theaters of war. DoesGenghis Khan have anything to teach us today? There is much that our leaders could learn from Genghis Khan, but we generally consider ourselves to be morally superior to him and therefore remain unwilling to learn. Yet he could have saved us from many failures in the Middle East and Central Asia. First, he fought wars he knew he could win, and he knew exactly what victory meant and how to achieve it. Victory came with total surrender of the enemy. He achieved this through the opposite strategy and tactics to those used by Americans in their modern wars. We targeted the big cities, such as Baghdad and Kabul, and built fortified compounds that served as headquarters and prisons, leaving most of the city and all of the countryside under the control of its enemies. Genghis Khan did the opposite. First, he conquered the countryside so that his enemies had no place to hide. Knowing that a city cannot live without access to the outside, he conquered the cities last and usually never bothered to enter them (with notably brutal exceptions). He kept his mobile headquarters outside. Genghis Khan recognized that he could not rule by force or by propaganda. He knew he needed a majority of the population to support him. He did this in two ways. First, he killed his enemies. He did not try to persuade them by building schools or digging new wells. He did not try to bribe them with wealth, power, or promises. Knowing that they would be forever his enemies, he killed them. Then he turned his attention to solidifying support from his allies. American presidents issue grandiose statements about democracy, human rights, freedom and other empty phrases that the Americans cannot explain and their conquered people in many instances do not understand, and then there is no follow through. Genghis Khan offered very specific and consistent laws and policies that he could enforce and never violate. These included guaranteed religious freedom for every individual, an end to kidnapping, an end to all religious violence, and end to taxation on religious institutions and personnel, an end to torture, and a guarantee of protection to those who remained loyal and quick and certain death to thieves, rebels, and all those who defied him or violated his laws. These were not empty words. He fulfilled every promise he made. We have spent years fighting in the Middle East without success. Genghis Khan conquered quickly, achieved total victory, and imposed a century of peace. How were the Mongols able to conquer China, Afghanistan, Iran, Iraq, Russia and Korea with fewer than 100,000 men while the US has had such a hard time taming Afghanistan with so many more men & so much more firepower? What was Genghis Khan's secret? Can we learn something from him? The Mongols were few in numbers. Genghis Khan had an army of about 100,000 and the Mongol nation was only about a million; yet he conquered hundreds of millions of people. For the Mongols, war was not a gentleman's game, it was a struggle to survive, and they fought fiercely knowing that their lives depended upon the outcome. Every city was offered the chance to surrender and be spared. Those who did saw their taxes remain the same or lowered and were not plundered. Those who chose to fight were defeated, and their soldiers and nobles executed. Anyone with a skill was usually spared – even a skill such as weaving or writing. Those with no skills were used for labor and often as shields for the army in the next battle. His law was harsh, but he always stuck to the law. He even removed a son-in- law from command for having plundered a city that surrendered, and then he made his hapless son-in- law lead the charge in the next battle. He died in combat. He was totally fierce in battle and totally committed to justice in peace. It was an unbeatablecombination. At the moment the United States can do neither. How did Genghis Khan deal with religious fanatics—and specifically Muslim assassins? Genghis Khan accepted every religion as true and valid. He recognized that in its principles and teachings no religion sought to be evil or to create suffering. He decided his task was not to suppress any one of them or to promote any one of them but to give all believers freedom to do the best work they could. This freedom, however, did not include a license to disobey the law or to follow any path they chose. Like a herd of obstinate camels, each religion needed to be harnessed to the others and kept on the road of righteousness. There was no separation of religion and state. Genghis won the support of many people by offering them religious freedom, but he recognized what the clergy most wanted was not freedom of religion. They wanted freedom from taxes, and he exempted all religious personnel as well as teachers, doctors, pharmacists, and undertakers from taxes. When he first encountered the Muslim fanatics known as the Assassins, based in the northern mountains of modern day Iran, he extended the hand of friendship to them. He met with their leaders and promised them the same freedoms as everyone else. He allowed them to keep their small kingdom, demanded no tribute, and promised not to invade them as long as they did not interfere in his empire. This truce lasted for a generation, but when the Assassins began to kill Mongol officials, Genghis Khan's grandson Hulegu invade their territory, tore down their supposedly impregnable mountain fortresses, and executed their imam, his family, and the entire army. He simply wiped them off the face of the earth. Within a few months, Hulegu also conquered Baghdad, executed the Caliph and his family and moved on to take Damascus. The Mongols struck a series of blows from which today, nearly 800 years later, the Muslim world still struggles to recover. You've written one book on Genghis Khan that was a bestseller. Why this new one? Ulaanbaatar, October 18 (MONTSAME) Deputy PM U.Khurelsukh received the United Nations Population Fund Resident Representative Naomi Kitahara on October 17. The Deputy PM extended his gratitude for successful projects and programs in Mongolia. The executive council approved a new country program for Mongolia for 2017-2021 during the 71st session of UNGA in New York in September. In accordance, projects, costing USD 15 million, will be implemented with a vision for improving reproductive health, youth development and gender equality. The Deputy PM pledged support for these projects. Mr Khurelsukh requested assistance in organizing of the Asian Ministerial Conference on Disaster Risk Reduction, to take place in Ulaanbaatar in 2018. October 19 (The Villager) Denver Zoo has selected Dr. Amgalanbaatar Sukh (Dr. Amgaa) as its 2016 Conservation Award winner. Dr. Amgaa is the director of Ikh Nart Nature Reserve and has been a partner of the zoo for the past 19 years. He will receive his award at the zoo's 19th Annual Conservation Night, Thursday, October 13, from 6:30 to 8:30 p.m. Zoo staff will celebrate their 20 years of field conservation efforts around the world with a special focus on Mongolia, its longest-standing conservation project. Dr. Amgaa has significantly advanced wildlife research and program management, as well as the long-term success of the Ikh Nart Nature Reserve (Ikh Nart), in central Mongolia. His dedication to the reserve and the zoo's conservation mission is evident through his time spent implementing programs with targeted education outreach and creating and fostering productive relationships with universities throughout the country. Dr. Amgaa has worked with the zoo since its early days of outreach efforts in Mongolia. As a researcher studying argali sheep, a globally threatened species found in Mongolia, Dr. Amgaa helped Denver Zoo collar the first-ever argali sheep with radio telemetry in 2000. Since then, he has continued to help employ GPS, satellite and radio telemetry techniques to gather data from more than 200 argali and 50 Siberian ibex sheep. Dr. Amgaa has also helped advise 10 Mongolian undergraduate and 7 master's students. Those students now work all over Mongolia in academia, government at federal and local levels, and in non-government organizations. In 2010, the United Nations named Ikh Nart a model protected area. Previously, it was relatively unknown and considered to be a "paper park," as it functionally existed on paper only. Now, with Dr. Amgaa's help, Ikh Nart is a prime example of a successful and collaborative protected area with a high standard for scientific research and positive local engagement. Amgaa shares research data collected at Ikh Nart with the local Mongolian government, highlighting critical wildlife habitat. As a result, local people and governments in Mongolia, agreed to expand the park's boundary. Furthermore, Dr. Amgaa and his team established the Ikh Nart Nature Reserve Administration Building in October 2013 and together with his team, created a new Ikh Nart Nature Reserve Management Plan. Since 1997, the zoo has presented its annual Conservation Award to someone who has made a significant contribution to wildlife conservation for at least 10 years, but remains largely unrecognized for their work. The event is an opportunity to recognize the individuals — the unsung heroes of wildlife conservation—who have made an impact toward conservation that year. The honoree is presented with the Conservation Award and a gift of $5,000 for the conservation project of his/her choice. Previous Conservation Award recipients include biologists, policy experts and wildlife advocates. October 18 (news.mn) Mongolian runners won gold and silver medals at the '2016 Nanjing International Marathon' on Sunday. Runner B.Dorjpalam finished the 42 km 195 m long route in two hours and 31 minutes, taking gold; Ts.Sanjidmaa won silver and Rio-Olympics runner B.Munkhzaya took fourth place in the marathon competition. In total, around 21 thousand runners participated in the Nanjing Marathon. Several African runners competing in a marathon in the eastern Chinese city on Sunday somehow got lost temporarily during the race, Xinhua reports. In all, five Mongolian runners competed in the Rio-Olympics marathon earlier this year. October 18 (news.mn) Internationally acclaimed vocalist Kenny Washington arrived in Ulaanbaatar two days ago. In Ulaanbaatar, he will give lessons to students from the Music and Dance College of Mongolia for three days. Also, he has been invited to appear on a TV music programme. Kenny Washington will open the Ulaanbaatar International Jazz series 2016-2017. His 'The Voice of Jazz' concert will take place at the State Opera and Ballet Academic Theater on 21st of October. In addition to Kenny Washington, jazz singer and pianist Champian Fulton, Catalan jazz pianist Ignasi Terraza, French harmonica master Laurent Maur and world-famous saxophonist Jesse Davis are arriving in Mongolia to stage live concerts. October 19 (Keep Me Current) Students from a performing arts school in Mongolia will spend a couple days working with students at Freeport High School this week and then highlight their stay with a free performance for the general public. The concert at Freeport Performing Arts Center begins at 7:30 p.m. on Friday, Oct. 21. "It looks to be a great cross-curricular opportunity for the students and a wonderful cultural presentation for our communities," Watts said. Ogilby said that 11 local families have agreed to put up the 22 students for the two nights. They attend a performing arts school in Mongolia, and range in age from teenagers to early 20s. Located in the continent of Asia, Mongolia is the 19th largest nation in the world. It became an independent state in 1921, after gaining its sovereignty from China. Ogilby was able to make the connection through Jim Lincoln, former Freeport High guidance counselor. Lincoln knows educators at a high school in Vermont that began the exchange program. "The teachers in Vermont have been bringing them to the United States for years," Ogilby said. "They have a connection with Jim Lincoln, who contacted them this summer. We went through the principal and the administrators here to make sure it would be a fit for us schedule-wise." Artists from the school in Mongolia have performed their flashy dance and singing routines at prominent occasions, such as the Shanghai World's Fair and the Beijing Olympics. People attending Friday night's concert will enjoy music played on the morin khuur, or horsehead fiddle, a traditional Mongolian bowed stringed instrument. The performers also will treat the audience to one of the world's oldest forms of music, throat-singing, a guttural style of singing or chanting. "It's going to be music and dance and singing, and traditional costumes," Ogilby said." During school hours on Oct. 20-21, the guests from Mongolia will conduct small workshops with students on the peforming arts center stage. Performing artists from Mongolia will put on a free concert at the Freeport Performing Arts Center at 7:30 p.m. on Friday, Oct. 21. October 18 (MONTSAME) "Khoomei" or Mongolian throat singing, which is a unique type of Mongolian folk arts has been inscribed in the UNESCO Representative List of the Intangible Cultural Heritage of Humanity. This type of singing in which the singer manipulates the resonances created as air travels from the lungs, past the vocal folds and out of the lips to produce a melody attracted the attention of art connoisseurs. They claim that a tradition of the Mongolian nation of worshipping the mother-nature has greatly influenced on khoomei originating. It is believed that the nation could develop this unmatched art through its ability to take a power and courage from the nature and penetrate its very sense. The most commonly practiced style, Khoomei are divided up into four main styles such as "karkhiraa", "isgeree", "narmai" and "shakhaa". These categories are representing bass-baritone-tenor voice types. The Mongolian throat singing can be accompanied with all types of musical instruments. October 18 (gogo.mn) Mongolian opera singers G.Ariunbaatar and S.Batchimeg were selected as lead soloists for opera Tosca by G.Puccini, which will be staged on Nov 3 at the Bolshoi Theatre. They were played for the title roles at the Opera and Ballet Theatre of Ulan-Ude last month. This time, G.Ariunbaatar was selected for the Baron Scarpia, chief of police and S.Batchimeg will sing the role of Tosca. Singer S.Batchimeg is the second soloist woman from Mongolia, performing at the Bolshoi Theatre. She has started working at the Opera and Ballet Theatre of Ulan-Ude since Sep, 2015. The wild, western borderlands of Mongolia - an untouched frontier where seas of grass baked golden by the sun morph into sweeping glacial valleys, snowy peaks and big blue skies - provide an epic backdrop for this intrepid expedition designed specifically for keen amateur photographers. To be clear, this will be an amazing, off-the-beaten-track trip, with immersive and exclusive access to the region's fabled eaglehunters, but one structured around three seperate 'ger-camps' which will give us time to scout contrasting locations and experiment with the region's spectacularly luminous light. So, if you are looking for a truly unique and immersive photographic adventure, with unscripted access to panoramic landscapes, cultural festivals (which often include wrestling and buzkashi) and traditional nomadic families, then this expedition is just the ticket. We are also pleased to confirm that, joining us on this unique trip, will be Anthony Lau, winner of the 2016 National Geographic Travel Photographer of the Year Award, an invaluable partner who has ensured we have thought through as many of the photography-specific details as possible, such as how best to safely store and transport camera gear and how to provide a reliable source of transportable power. Finally, the timing of the trip has also been devised to coincide with the Perseids meteor shower which is scheduled to peak on the evening of August 12th and 13th. Oh - and did we mention the eaglehunters? October 18 (news.mn) 'MIAT' Mongolian Airlines has banned 'Samsung Galaxy Note7' on its all flights. This comes after various, potentially serious incidents around the world. 'Samsung Galaxy Note 7' phones have already been banned on all U.S. airline flights after nearly 100 incidents of the devices overheating and, in some instances, bursting into flame and injuring their owners, the US Federal Aviation Administration (FAA) announced Friday. Previously, airlines had been urging travellers not to turn on their phones, pack them in checked luggage or charge them during a flight. A Samsung phone smoking before a Southwest Airlines flight took off on October 5th , forcing the evacuation of passengers without any injuries. The passenger in question dropped the phone on the floor of the plane, where it burnt a hole through the carpet. The company estimates the recalls will cost it $5.3 billion. October 18 (news.mn) International and local flights were delayed due to high winds at Chinggis Khaan Airport on Tuesday (18th of October). Flights to Beijing, Seoul and Turkey have been delayed for several hours. The Seoul flight, which had been scheduled to depart at 08.45 a.m. was postponed until 17.00 p.m. due to the wind. Three Mongolian local flights to Oyu Tolgoi were also delayed until the wind speed decreased. October 18 (Gate 1 Travel) Mongolia's national flag tells a story. In its left bar, the Soyombo stands proud, a symbol of Buddhism—the sun, moon, stars, and heavens represented in ornate geometric form. It seems simple enough, this national proclamation of united religion. But it stands for a victorious triumph after a long 20th-century struggle under Communism. In 1924, Mongolia was home to 100,000 Buddhist monks. But as Communism took hold from neighboring Russia, 700 monasteries were closed or destroyed, Buddhist teachings were repressed and monks were killed. By 1990, 110 monks lived quietly in hidden monasteries. A year later, with the fall of Communism, that all changed. Buddhism once again rose as Mongolia's dominant religion, and other religions such as shamanism also emerged from the shadows. It's a long, dark chapter, one that underscores the unwavering passion of a peaceful people. And it holds a lesson: Don't let Genghis Khan, Kublai Kahn, and the warring ways of the Mongolian Empire fool you. Mongolians are peace-loving, big-hearted, and eager to share their culture with visitors. Mongolians of today are not defined by borders, but by openness; it might be the wide spaces and vast steppes in which they live that lulls them into kindness. That's why you're likely to get invited into many a ger (the circular, tented structures they call home—again, no harsh straight lines here) for tea, mutton soup, or a cup of airag, fermented mare's milk. Fried dumplings, called khuushuur, might also be on the menu. To be sure, Mongolian cuisine is simple, derived as it is from nomadic ways that require the most efficient use of livestock and humble harvests. And don't be surprised if you're invited to wash it all down with Mongolian grain vodka, a holdover from Russia's occupation. Seasonal festivals similarly take their cues from a rugged past. The Naadam, for instance, is perhaps Mongolia's most famous national sport gathering. For three days each July, towns all over the country participate in Olympic-style games of strength and endurance. Naadam is known locally as "Eriin Gurvan Naadam," or the Three Games of Men: wrestling, horse racing, and archery. In these modern times, the Games' title is no longer accurate as women now participate in the latter two. (The wrestling costume, an open-fronted jacket called a zodog, ensures that women do not try to enter that competition.) Naadam is a tradition that dates back 1,000 years, and the events are based on the traditional hunting culture of the Mongolian army. At the largest venue for the Games, in Ulaanbaatar, more than 600 horses stampede across the steppe for ten miles. The Golden Eagle Festival—founded very recently, in 2000—demonstrates another symbol of military might: the event's namesake bird. This powerful raptor has long been used to hunt for food and pelts, and each October the best falconers descend on a valley in the Altai Mountains to show off the speed, agility, and accuracy of their birds. No doubt music plays a part in these celebrations, and most certainly at more intimate gatherings. Like so much of Mongolian culture, the country's music has firm roots in nature and nomadism. The nation's most famous instrument—the morin khur, a bowed stringed instrument with a boxy base and long neck—is said to produce a sound resembling a neighing horse or, even more poetically, a breeze blowing through the grasslands. Khoomei, or throat singing, is a haunting multi-tone melody produced deep in the throat. "Long song"—so named not because of a song's length but because of each syllable's length within the song—also plays a crucial part in the Mongolian songbook. Experience Mongolia's rich and welcoming culture during our Mongolia & the Gobi Desert trip. Click here to learn more! October 17 (The Guy Travel) Nested in between the giantic countries China and Russia, there lies Mongolia People's Republic. With only 3 million population but being the 18th largest country in the world which was ruled by the famous Gengis Khan, one could not help but to admire the vast grassland that the country offers. Previously, I have written a post onYour Travel Guide to Mongolia in 4 Days. In this post, I will be covering on the 4 essential things that you got to try when in Mongolia. In Mongolia, pratically everyone knows how to ride a horse. The people living in the capital of Ulaanbaatar or in the highland, children on the street, street vendors, restaurant owners, practically most of them had master the skills of riding horses. Even during my drive to the countryside, music and songs of horses were constantly played. It shows the tremendous devotion of the people love for horses. Thus, the best way to experience horse riding is to stay with a nomad family. You would not have considered stepping on Mongolia without at least a night stay in the wild countryside. Experience the nomadic way of life which dates back to more than 3,000 years as they seek greener pastures for their livestock each time. In fact, I learnt that these families have a fix site for different seasons of the year. Neighbours help one another in looking after livestock, taking care of kids, setting up of what they called it as Ger for their home, etc. So step into the life of the nomad family and you will likely fall in love with the true warm hospitality of the Mongolians as they share their daily life with you. Mongolians are one of the most fun loving people around and they make you feel at home immediately. After all, we travel to experience other people lifestyle and remember to always respect another culture and practice. The toilet was one of the unforgetable experience for me in my travel life thus far. Staying with the local nomads, I had drank too much Mongolian beer from the ever welcoming host. I had to use the loo in the middle of a freezing night. Toilet in wild Mongolia land mean just 3 metal sheets that provides you privacy and a hole dug deep into the ground. I was doing my business half way when the metal sheet on both sides just blown away due to the strong wind. Mongolians usually serve their guests with the Yak milk. Yak milk is used to make cheese, soups and curds. Meat is a staple food in Mongolia food scene. If you are a mutton lover like me, I am sure Mongolia food will not disappoint you. Mutton and beef are the usually the meat consume. One should eat the Buuz, a dough dumpling filled with mutton or beef, a popular snack that is simply so delicious! Chinggis Square, formally known as Grand Chinggis Khaan Square is the central square of Mongolia's capital Ulaanbaatar. You will be able to learn from the most respected man in Mongolia of his ideas, his courage to conquer the world. Soak into the atmopshere and take in the city sight. There is a big statue of Genghis Khan who is seated on a chair.